What Are You Really Working On Today? JPD Designer Lisa Gorham discusses the research and planning stages in creating the Annual Report for the Community Foundation of Frederick. Recently, we launched into the world of social media marketing and have seen some great results we’d like to share. First though, I will advise you that a good social media plan is one that is well thought out and the tools are wisely chosen to carry out the plan. With that said, you still must evaluate and be flexible enough to react to the daily evolution of social networking and to measure your results. Our initial strategy was to network with local Frederick businesses and tell them what we have been up to. This directly parallels our recent direct mail campaign that was mailed to carefully selected regional and national businesses. We sent the hand-picked organizations a striking black box containing samples of our work along with a personalized letter explaining why JPD is a good fit for their marketing needs. Strategically placed amongst the samples were examples of our recent ad campaign that conveys some of the services we offer. The packages have been successful, so naturally we wanted to build on that success. Social media marketing was going to be our means. We had already engaged in LinkedIn but knew we had to do more. We chose three other tools to get the word out—a blog, YouTube and Twitter. We chose them for very specific reasons. We use the blog to write about design, and in several cases have written about how design can be improved through better use of typography and layout. We know that in the current economy, client’s budgets are limited forcing them to keep some projects in-house. If we can help them in this way, we will. This leads us to YouTube. We are using YouTube in several ways. We started off with our summer intern posting videos in which she poses the question to our designers, “What are you working on today?” Subsequently, the designer then answers a few more questions about their specific project. This helps to give clients and potential clients an idea of the projects we work on daily. We also use YouTube to post client video projects. The video we work on generally fits in with a larger campaign. Now, for how Twitter fits into all of this! Twitter allows us to keep in touch with our clients and potential clients in a moment’s notice. We post links to articles we find interesting, announce when a new blog post or YouTube Video has been posted, promote our trusted vendors and have ongoing conversations with our followers. After choosing the tools we would utilize, we turned to design. With social networking, most of your design options, especially with third-party applications, are limited. Using our already established web design we branded our blog and YouTube Channel. We even gave our blog a fun name—“ad:chat”. Each team member also uses a uniquely designed headshot that matches the larger JPD campaign. Notice, my headshot is pink and my business card is pink too. Check out our website to see what everyone else’s pictures look like. Once we started using the tools, we began to monitor and measure our successes and weaknesses. We noticed that each time we posted a video on YouTube we received the most hits on our website. If we tweeted about it and provided a link, the hits to the site grew even higher. We keep an excel spreadsheet that helps us track the items that are most important. Furthermore, we employ the url shortener bit.ly that can track how many times someone clicked on our link and how many times others retweeted the message. 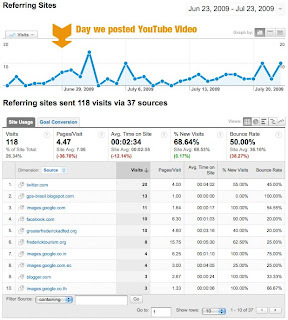 With all this data, we can then go to our Google Analytics reports and drill down into the findings and see if what we are doing really works. Here is an example of one YouTube video we posted and tweeted. One cool thing that has happened is our ranking in a YouTube search. When you type in “powerpoint sales presentation” our video is the 2nd none-paid-for listing! That’s success. 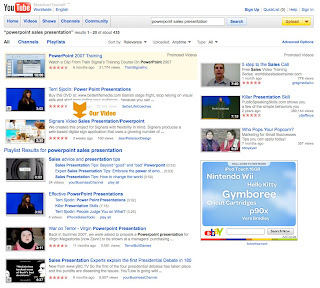 A “powerpoint sales presentation” search done in YouTube reveals our video is third in the results. This is just a small glimpse into how at JPD we are using social media marketing and see some results in terms of traffic to our website.